Some days are better than others. Today when I got out of bed, I looked at the last photo ever of Bella and I, which was taken 9 months ago, and I was reminded of all that is missing. I was reminded of the last moments I missed out on and the photos I could have taken. There seems to be many reminders this past week of how life must go on. Last weekend my car was wounded but it turns out that was the last drive we would ever take together. Matilda was more than just a car to me. She was my safe heaven, my refuge, during Bella’s entire life. Her and I spent a lot of time driving because colic is a terrible thing to experience and it was often the only way I could get her to sleep. Some days it was the only ME time I would get. Even after the colic, a drive was still often the only way Bella would nap. So many memories. Daily drives to daycare, how she would take off her shoes and socks and throw them so I would have to search for them every single day. 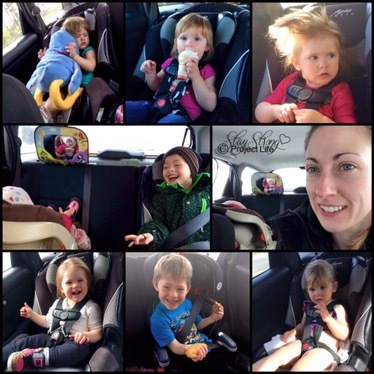 How Hudson taught her to dance in her car seat and I would try to watch them in the rear view mirror as I was driving because I knew that these were precious memories I wanted to hold onto. How I still find “gifts” from her hidden, like her name tag or hair clips. How I still look in the rear view mirror and visualize her sitting in her seat. I’m not ready to say goodbye to my car. It’s just one more reminder that life continues after loss. One more loss. One more slap in the face. Apparently the Universe doesn’t think I have been through enough yet. After the month I’ve had, I’m surprised to still be standing, but I am! Standing stronger than ever because I have survived and continue to fight! How much can one person endure? It all started with Bella’s colic, but I believe that life has unfolded the way it has in order to make me stronger so I could get through the next challenge. I needed this strength in order to survive the unimaginable devastation I’ve been forced to endure, and the losses and cruelty keep coming at me! There was a time when my family splitting up was my worst fear. I survived life as a single mother although it was difficult. Every single day was a challenge. Looking back, I didn’t give myself enough credit because the pictures I took show a happy family full of love. We had those happy moments every single day! I believe I still don’t give myself enough credit. I have come a long way. I had a setback last week and my return to work didn’t go very well, but that’s okay because I WILL try again. It’s only considered failing when you give up! And after the month I’ve had, it’s no wonder the transition didn’t go smoothly. This past month I met with the coroner to review Bella’s report which left me with more questions than answers. Now I have decisions to make with regards to further research and testing, or to let it be and accept that I will never have all the answers. Court and custody issues are draining, but when you are accused of murder in a court of law, that can really affect a person. How could someone ever think I am capable of such a horrible thing? I still can’t believe my name and that word were even uttered in the same sentence. Obviously there are no grounds for the accusation and it was an act of desperation, but that is not something I will ever be able to forget. (* I would like to clarify that the custody issues do not involve my son.) Losing my car, returning to work, being sick, and soooo much more. I am exhausted and in desperate need of a break. I’m not giving up but I need to take a time-out to process it all, reflect, and most importantly, REST! Life hasn’t been easy, but I refuse to let what has happened to me define me. I am breaking down but I believe it’s the next logical process. I am a Phoenix and I am on fire. It’s only a matter of time before this fire burns out. When things cool off, I’ll be able to rise from the ashes and I will be different, transformed. It is a process and I’m meant to experience it. Click HERE to watch a special video.